Starting an online business is seen by many as a great way to make money and a cheaper and easier option than creating an offline business. Despite the risks, thousands of people in the UK and US start online businesses every month, to varying levels of success. This entrepreneurial spirit only seems to increase during difficult financial times; which the western world is currently facing. Starting an online business no longer requires technical knowledge or previous experience as there are a raft of tools, programmes and applications to help business owners create and manage a website, online marketing and customer relationship management. There is also a shift in society and attitudes towards the work/life balance. Now, running an online business, often from home, is seen by many as the perfect way to earn revenue whilst enjoying life. 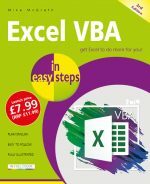 Start an Online Business in easy steps will show you how you can be one of the success stories rather than one of the statistics. Whether you’re intent on working full-time on your business from day one, or whether you’re looking to improve your work/life balance and secure a second income, this book will walk you through the steps to creating and running a sustainable and profitable online business. This book is intended for entrepreneurs, employees, employers, mums, dads, students, existing website owners, in fact anyone interested in starting a business online no matter what their level of experience. It is for the non-techie who wants to be involved with every facet of setting up and running their own e-business. 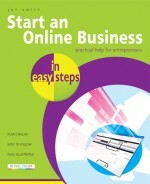 Start an Online Business in easy steps will show you how to research, prepare and run your own online business and will also give you the tools and the confidence to be able to explain to other staff members, clients, potential suppliers and of course customers, about what your online business is, and what it can do for them. 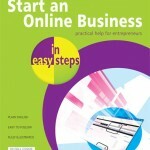 With so many favorable possibilities, it's no wonder entrepreneurs are looking at the web as a viable platform for their idea and Start an online business in easy steps will help you get your online business off the ground and into profitability - written by someone who's really been there and survived to tell the tale. Jon Smith is a digital strategist and writer. Currently Chief Marketing Officer for Autocab, he was part of the launch team for Amazon.co.uk and Kitbag.com and served as Vice President Marketing at Whisbi. Jon has been marketing websites and providing strategic advice to companies seeking to improve their online presence for over twenty years. He’s launched, run and sold his own online businesses and has written extensively about website marketing and best-practice. Jon is the best-selling author of fifteen books including Get Into Bed With Google, Google Adwords That Work and Dominate Your Market With Twitter.